37 3/4 x 35 9/16 in. DC Moore Gallery is pleased to present Outset, an exhibition of new paintings by Barbara Takenaga, the artist’s fifth at the gallery. The exhibition is accompanied by an illustrated catalog with an essay, “On Systems of Radiance” by art critic Lilly Wei. Takenaga pushes into further realms of meaning in this new body of work, incorporating motifs drawn from earlier paintings with new forms and fluctuations of space. Through a labor-intensive process that begins with the nonspecific pouring of paint onto canvas, Takenaga allows for unexpected happenings and accidents. From these earliest pours, she then coaxes her lyrical and complex vocabulary of marks, methodical patterns blending with the residue of chance. The forms she renders are completely abstracted yet suggest influences as diverse as the natural world, traditional Asian arts, and extraterrestrial phenomena. The ethereal motif recurs in other works, such as the mysterious Manifold (2018), a sprawling and luminous five-panel painting, its construction reminiscent of Japanese Byōbu folding screens, anchors the show. Dominated by an elegant swoop of black space emanating from a silvery background, the work is flecked by dozens of spout-like shapes that suggest diminutive geysers, or perhaps flickering candlesticks. The gossamer forms resist literal interpretation just as they resist being pulled into the void of black. The vacuum itself in turn unfurls asymmetrically, as Takenaga creates a tensional push-and-pull across the panels. Close scrutiny of the painting reveals a scrupulous, scallop-shaped pattern ebbing through the dark expanses of paint. The detail reflects how the artist is an advocate of the Pattern & Decoration movement of the 1970s just as much as it does her interest in the organic, the repeated markings like the ordered scales of a fish. Manifold is simultaneously indicative of the infinite expanse of the universe, and also the earthbound mysteries of our own world. Barbara Takenaga’s work was the subject of a twenty-year survey exhibition at Williams College Museum of Art, a large-scale public commission for SPACE | 42 at The Neuberger Museum of Art in NY, a recent solo exhibition this past spring at the Huntington Museum of Art in West Virginia, and a large-scale installation Nebraska recently on view at MASS MoCA in North Adams, MA. Born and raised in Nebraska, the artist currently lives and works in New York. 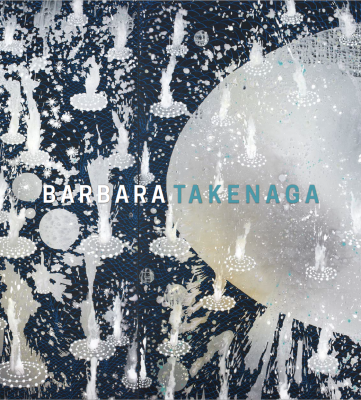 Barbara Takenaga — Final from DC Moore Gallery on Vimeo.